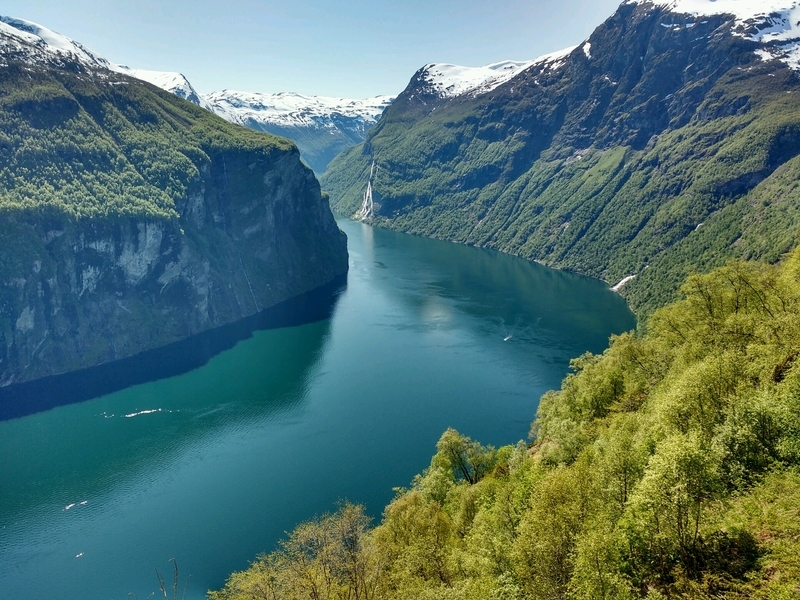 You will never forget sailing into the grandest fjord in all Scandinavia. The waters are glassy and lacy waterfalls dance down from dizzying heights on either side. Tiny farms cling impossibly to sheer mountainsides. And at the end is a friendly town and a roadway to the crest of the mountain called Eagle's Nest, for a bird's eye view of the waterway seen from the sky. By far the most spectacular arrival/departure -- definitely worth getting up early to see the fjord in detail on the way into port, and to go late to dinner on the way out of the fjord. We took the fjords and glaciers shore excursion, which was very nice (five-foot deep snowbanks along the road, and snow fell on us when we got off the bus). It also included a nice lunch. It would have been even better if it hadn't been so foggy when we got to the glacier -- we really couldn't see much. But the scenery along the way, and the stops for short walks alongside waterfalls, etc., were just amazing. We also thoroughly enjoyed our tour guide, who provided a lot of interesting information (including music) along the way. 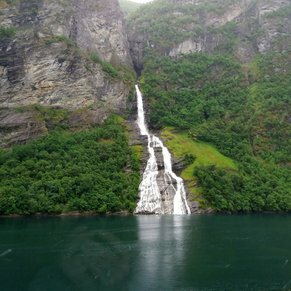 Wow - magnificant scenery ... we had a faultless tour with Norwegian Excursions. Monika was brilliant!! Perfection! Probably my favorite stop on the cruise. The morning started off with a Polar Plunge available to any passengers that wanted to. I think they were shocked as we had about 30 people decide to jump. They had them go off the back sports platform area 4-5 at a time. Warm water shower and towels were waiting for them when they got back on the ship. Great fun way to start the day! We lucked out with sunny blue skies and were the only ship in the port. It is like being in a fairytale, it's that pretty! We did the rib boat tour here and got up close and personal to the waterfalls the 7 Sisters and the Suitor. Our guide Neils was really great and shared a lot of stories and answered any questions we had. We wore a fairly heavy waterproof suit which was good as it was early morning when we left. We were out on the water about an hour, it was over too soon. We then walked around town and up the stairs to another waterfall. Stunning views of the port area. Great place to take pictures of the ship. Pretty little church, but we didn't go over to it. The shops in the downtown area by the dock are full of everything imaginable. The little chocolate shop has great handmade chocolate items. The fjords into Geiranger were breathtaking!! Such sheer cliffs with water cascading off. Very serene with the quiet water of the fjords. Once in town, the Hop On Hop Off bus allowed you the opportunity to visit several places without the extreme hiking it would require without transportation. Make sure you take the bus trip to the top of Dalsnipper Mountain. We were in 6 inches of fresh snow in mid August! Breathtaking views on the ride up and down through 91 hairpin turns! Fantastic!!! 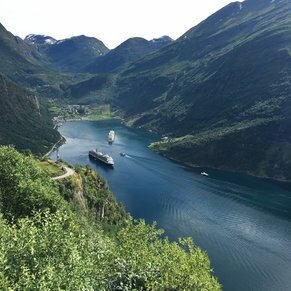 3 of 1 shore excursions in Geiranger, Norway. 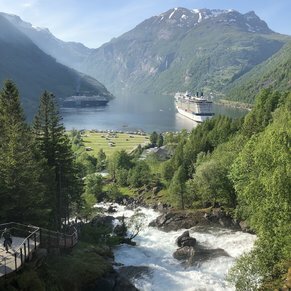 There are currently 0 discussions about Geiranger, Norway.